The RELIEF Pre-Commercial Procurement (PCP) project is looking for interested entities to jointly innovate. A call for tender has been launched for innovative ICT solutions to improve the self-management of chronic pain. RELIEF (Recovering Life Wellbeing Through Pain Self-Management Techniques Involving ICTs) is a Pre-Commercial Procurement project funded by the European Commission under the Horizon 2020 Programme. The project tackles chronic pain conditions which affect more than 95 million of European adult population. Currently, there is a wide range of devices related to eHealth but it is necessary to work in the gap between research and commercialization of these products. New ICT solutions are explored by using a Pre-Commercial Procurement process. The project has received a funding of almost 2 million euro and is composed by 6 partners from Spain, France and Sweden, among which three Health Public procurers (Servicio Andaluz de Salud – SAS in Spain, Groupement d’intéret public – Réseau des acheteurs hospitaliers –GIP RESAH in France and Uppsala County Council – CCU in Sweden); additional supporting partners are the Hospital Federation of France – SPH Conseil and one Research Group from the Open University of Catalonia – UOC. How will it be executed? The RELIEF tender (#689476) will be executed in three Research and Development Phases, ending in January 2019. Up to 8 companies will participate in Phase A: Solution Design (budget up to 378,000 EUR, duration 6 months), up to 4 companies in Phase B: Prototype development (budget up to 661,500 EUR, duration 6 months) and up to 2 companies in Phase C: Pre-Commercial small scale product/service development (budget up to 850,500 EUR, duration 1 year). A public notice that will be published on the TED database (Tenders Electronic Daily) TED is the online version of the ‘Supplement to the Official Journal of the European Union’, dedicated to European public procurement. Pre-Commercial Procurement (PCP) is the procurement of research and development of new innovative solutions before they are commercially available. PCP involves different suppliers competing through different phases of development. The risks and benefits are shared between the procurers and the suppliers under market conditions. 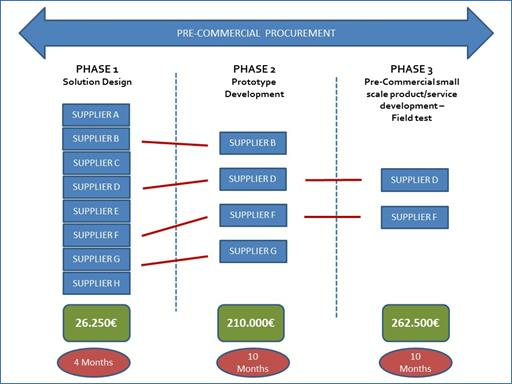 Competitive development in phases is the competitive approach used in PCP by procurers to buy the R&D from several competing R&D providers in parallel, and then compare and identify the best value for money solutions available to address the PCP challenges. R&D is split into phases (solution design, prototyping, original development and validation/testing of the first products) with the number of competing R&D providers being reduced after each evaluation phase. It is important to mention that PCP solutions are no near-to-the- market solutions yet and new R&D is needed. PCP can then compare the pros and cons of alternative competing solutions approaches. This RELIEF PCP tender is an opportunity to all interested eHealth entities to develop new products and services related to improvement of chronic pain self-management. The RELIEF PCP call for Tenders is open until 15 September 2017. All Tender documents are available on the RELIEF website.